For False / Fake Nails. Nail Art. Nail Tips. Special Precautions Avoid contact with clothing as can cause burn. Applying cyanoacrylate to materials made of cotton or wool (such as cotton swabs, cotton balls, and certain yarns or fabrics) results in a powerful, rapid exothermic reaction. The heat released may cause minor burns, and capable of igniting the cotton product, as well as releasing irritating vapour in the form of white smoke. Material Safety Data Sheets for cyanoacrylate instruct users not to wear cotton or wool clothing, especially cotton gloves, when applying or handling cyanoacrylates. Avoid breathing vapour, contact with eyes/skin. Allow product to reach room temperature before use. High strength, medium setting adhesive which is specifically design for the cosmetic industry. It has been specially formulated to comply with the European cosmetic regulations. 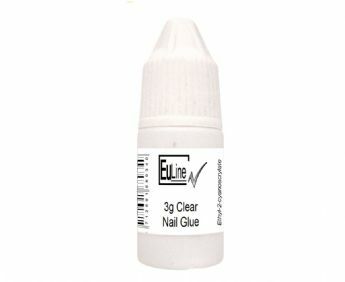 Provides the strongest possible bond when bonding false nails. Directions for use: 1. Make sure the surfaces to be bonded are clean and dry. 2. Dispense a drop or drops to one surface only. Apply only enough to leave a thin film after compression. 3. Press parts together and hold firmly for a few seconds. Good contact is essential.An adequate bond develops in less than one minute. (Maximum strength is achieved in 24 to 48 hours). 4. Wipe off excess adhesive from the top of the container and recap if left uncapped, may deteriorate by contamination from moisture in the air.